GOAT FEEDING SYSTEM - Throughout the world there are many research facilities that focus on the use of goats in that they are an excellent candidate to conduct ruminant nutritional research studies. Calan has successfully developed a specialized goat feeding system suitable to individually feed growing or mature goats. 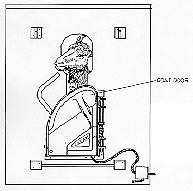 The system can be used with goats ranging in size from 40lbs. to 150lbs. body weight. Both meat type and dairy type animals can be adapted to the system. Usually the goats are subdivided into pens of 6 to 10 goats each. 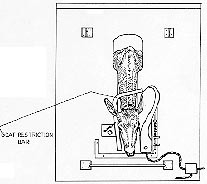 As can be seen in the accompanying illustrations, a special test tub equipped with a removable drawer is utilized to accommodate forage or concentrate rations. A special security bar is used in connection with feeding goats to insure that perfect animal security is maintained. Approximately 2 ft. of space is required for each goat, therefore, a pen of 6 goats would require an overall length of 12 ft. along an existing feed alley. The Calan Data Ranger can be a valuable piece of equipment to mix, dispense, and capture orts for larger goat research installations. Goat Test-Tubs augment the Broadbent Goat Feeding System. The Goat Test-Tubs abut the feed barrier for total individual animal feed control. Together they feed loose-housed goats as individuals - no stealing, no spilling, no spoiling, no contamination. Three-sided, high walled design prevents neighboring animals from exchanging or stealing feed. Detaches easily from latchbar for refuse recovery, cleaning or storage. Holds a full day's goat ration. Heavy-duty fiberglass withstands high-pressure washing and other sanitizing procedures-as well as rugged goat use. 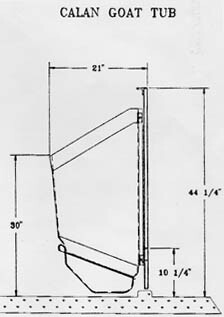 height and shape of Test-Tub opening permits filling by hand or machine. Test-Tubs nest in stacks for economical shipping. Complete instructions, plans and hardware are supplied for easy assembly. CALF FEEDING SYSTEM - In many instances research facilities have need of an individual feeding system that will accommodate weaned calves through the heifer rearing stage. Calan has found that using a miniaturized Calan Broadbent Feeding Door can work effectively with calves ranging in size from 175lbs. to 500lbs. The use of a smaller door can reduce the overall feed bunk space required in equipping a heifer rearing facility. Another variation of the Calf Feeding System is to utilize this equipment for feeding veal calves. We have experienced excellent results in using the calf feeding doors in veal calf nutritional studies. SHEEP FEEDING SYSTEM - The Calan Sheep Feeding System also uses a miniaturized Calan Feeding Door. Although the practice is not widespread, there have been several successful nutritional research studies involving sheep. Some of the earliest work in this area was conducted under the direction of Mr. Camel at the Grassland Research Institute in England. A copy of the research publication is available from Calan upon request.